Early in the 20th century, Covington commuters who made the daily trip to New Orleans were served by railroad in addition to lake steamer. The "St. Tammany Special" was a train made up of several cars that made daily trips between New Orleans and Covington. Its schedule called for it to leave New Orleans at 4:30 p.m. each day (except Sundays), arriving in Covington at 6:15 p.m. The train would then leave Covington the next day at 6:45 a.m. and arrive back in New Orleans at 8:30 a.m. The trains were comprised of "elegant vestibule coaches and Parlor Buffet Cars." 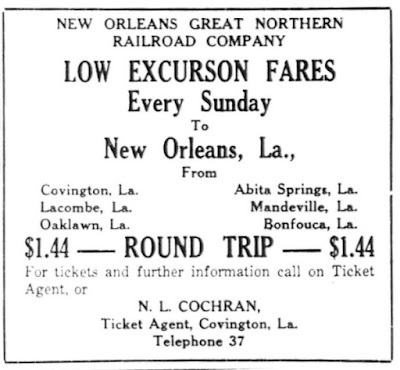 There was also a local train that left New Orleans each morning (except Sundays) at 6:30 a.m. and arrived in Covington at 9:30 a.m.
On Sundays and Wednesdays, there were "Excursion Trains" that left New Orleans at 7:40 a.m. and arrived in Covington at 9:55 a.m. They would leave Covington to head back to New Orleans at 4:55 p.m.
On the "Remember Covington..the way it was..way back when..."Facebook page, John Grey said the St. Tammany Special began operating on May 27, 1903 to give "comfortable and quick access to the balmy resorts of the Ozone Belt." In a newspaper article published at the beginning of the train's service, Grey read that "it was one of the first suburban trains in commission in the country. It ran the day before as a celebration with invitations from the N. O. & Northeastern and East Louisiana officials to rarlroad and newspapermen to make the initial trip. In some stretches the train made a speed of over 60 mph." Grey goes on to quote the article as saying the train was ventilated from one end to the other and consisted of a combination baggage and club car and three modern coaches. "The windows on the club were practically continuous making for a good view. It was fitted with the most comfortable type of easy chairs, and breakfast was served in the club car, consisting of coffee and eggs, cold meats and relishes and all kinds of drink.The club and coaches were finished in quartered oak," the article noted.